Marine mollusks(animals) strip off their calcareous casing from time to time. These are sea shells which are painted, etched, carved, cut and sculpted to form various utility and decorative handicraft items. Some of the shells used are puka, nautilus, mother of pearl(mop), blacklip, brownlip, hammer, troca, paua etc. Sea shells have been used by mankind since the stone age. They not only adorned their jewelry but also their boats and other belongings. Soon shells became an important part of their life. Some tribes even used shells as money. Among the Greeks and Romans, shells were a symbol of prosperity. Collecting and decorating with shells became a hobby for the aristocrats. 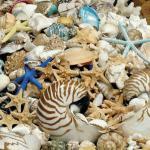 Shells are used to make decorative tiles & floorings, walls, pots, picture frame & mirrors, jewelry boxes, lamp shades, ash trays, incense stick and candle stand and jewelry. Bone has been used by human beings from the very beginning. Probably the bones left after decay of the animals was discovered by man. He might have used it as a weapon for hunting and defending himself. Subsequently it was put to various uses by carvers when not only utility but decorative objects of art were made. Captive jewelry, beads, combs etc are made from bones. Due to the ban on ivory craftspeople have shifted their skills in ivory carving to horn craft. Sarai Taran is a well-known centre for horn work cutlery handles, and engraved furniture.